As a pet owner, we are always looking for unique and usual items for our furry family members. Look no further! 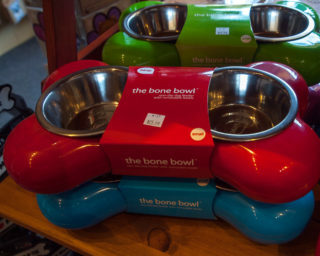 Located in downtown Eureka Springs, Blackie’s Backyard is a great store for both Pets and Pet Lovers. 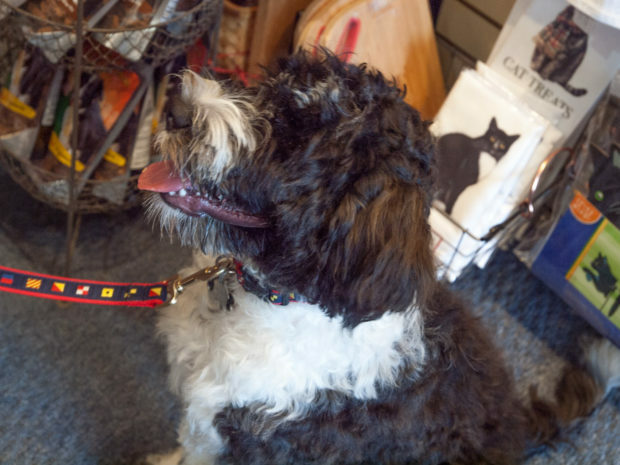 Your dog will know he is in a pet friendly store immediately. Blackie’s Backyard is the culmination of the dreams of Todd and Debbie Allen. The Allen’s were living in South Dakota and discovered Eureka Springs in 2010. After wintering here for three years they decided to become permanent residences. Once settled they opened their dream store, Blackie’s Backyard. They named the store after their beloved Border Collie who was with them for 14 years. Blackie’s Backyard is definitely a pet friendly store. While we were taking photographs, Splash, a Portuguese Water Dog, came running in to say hello. Dogs recognize a good thing. There is a water bowl outside the store and a Blackie’s Treat waiting as soon as they come inside. Treats are available in three different flavors. Peanut Butter Pumpkin, Peanut Butter Banana, and Peanut Butter Molasses. Four legged friend can upscale their appearance. 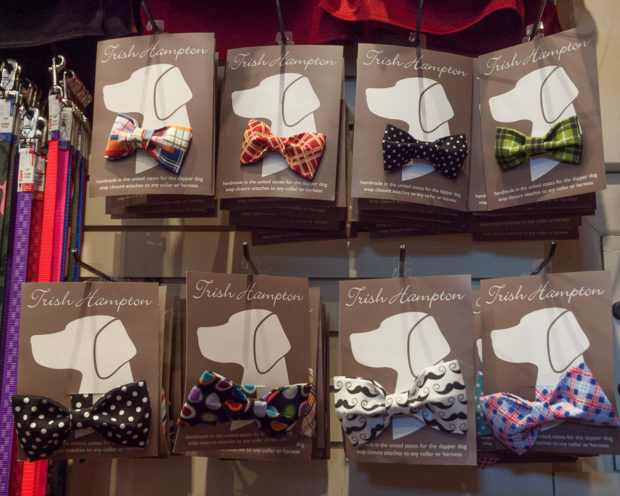 A vast selection of printed and patterned dog collars, leashes, and bow-ties to make your dog stand out. If you have a smaller dog be sure to check-out the slings. They look like the sling you used to carry your infant. Sized in small, medium and large depending your size—not the size of your dog. We love the sling idea here in Eureka Springs when the streets can be very crowded. You can tuck your dog in the sling and be hands free and not worry about a leash. You will find an amazing assortment of pet bowls. Every color and size you could want. These would be fun holiday presents. Cat Caves are a hit. Our favorite and a favorite with our feline friends are the Cat Caves. If your kitty is one that likes to tuck away for nap-time, you will always know exactly where to find them. The Cat Caves create the perfect cat bed that shapes itself around kitty and makes a cozy den. 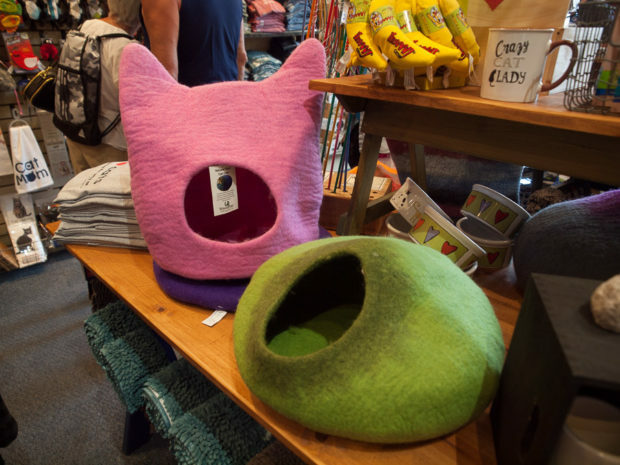 The Cat Caves are hand-felted wool made by a group of women in Nepal. We have four different pet friendly cottages with lots of fun critters on the property. Our canine guests love their visits. And they know exactly where to go to look for their bowl of water and treats in the cottage when they arrive.